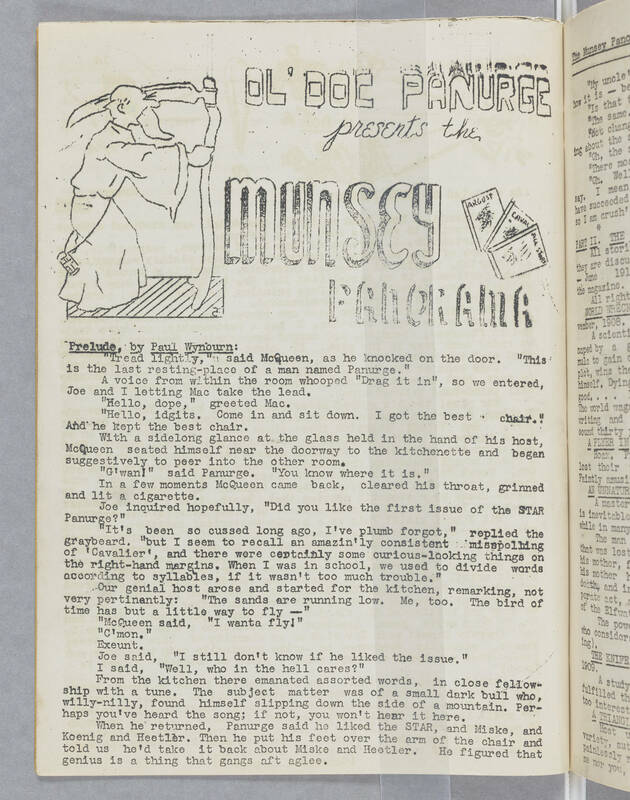 OL 'DOC PAURGE presents the MUNSEY PANORAMA Prelude, by Paul Wynourn: "Tread lightly," said McQueen, as he knocked on the door. "This is the last resting-place of a man named Panurge." A voice from within the room whooped "Drag it in", so we entered, Joe and I letting Mac take the lead. "Hello, dope," greeted Mac. "Hello, idgits. Come in and sit down. I got the best chair." And he kept the best chair. With a sidelong glance at the glass held in the hand of his host, McQueen seated himself near the doorway to the kitchenette and began suggestively to peer into the other room. "G'wan!" said Panurge. "You know where it is." In a few moments McQueen came back, cleared his throat, grinned and lit a cigarette. Joe inquired hopefully, "Did you like the first issue of the STAR Panurge?" "It's been so cussed long ago, I've plumb forgot," replied the graybeard. "but I seem to recall an amazin'ly consistent misspelling of "Cavalier', and there were certainly some curious-looking things on the right-hand margins. When I was in school, we used to divide words according to syllables, if it wasn't too much trouble." Our genial host arose and started for the kitchen, remarking, not very pertinently: "The sands are running low. Me, too. The bird of time has but a little way to fly --" "McQueen said, "I wanta fly!" "C'mon." Exeunt. Joe said, "I still don't know if he liked the issue." I said, "Well, who in the hell cares?" From the kitchen there emanated assorted words, in close fellowship with a tune. The subject matter was of a small dark bull who, willy-nilly, found himself slipping down the side of a mountain. Perhaps you've heard the song; if not, you won't hear it here. When he returned, Panurge said he liked the STAR, and Miske, and Koenig and Heetler. Then he put his feet over the arm of the chair and told us he'd take it back about Miske and Heetler. He figured that genius is a thing that gangs aft aglee.